In the end it wasn’t enough. Not the millions of dollars that poured in from frustrated Democrats across the country. Not the hundreds of volunteers who took to the streets of Atlanta’s northern suburbs, knocking on doors and exhorting motorists. Neither were enough to lift long-shot candidate Jon Ossoff above his 48 percent showing in April’s special election for Georgia’s 6th Congressional District. Tuesday’s runoff result was as many predicted from the beginning: A safe Republican seat going to a safe Republican candidate, Georgia former secretary of state Karen Handel. But along the way, as Democrats’ hopes rose at the thought of using what otherwise would have been a ho-hum local election to strike back at an unpopular president, the race became a proxy war among powerful national political interests. One of the most active and engaged was, perhaps not surprisingly, Planned Parenthood, which got involved early on through its 501c4 political advocacy arm, spending more than $800,000 trying to nudge Ossoff over the top. The reproductive health-care organization devoted months on voter outreach efforts, which included online advertising, social media, direct mail pieces, phone banks, and thousands of hours of neighborhood canvassing. The obstacle? The undeniable fact that while Democrats in the 6th District were far more excited than their GOP counterparts, the other side had greater numbers. During his concession speech, Ossoff thanked the “more than 12,000 of you” who had “provided a beacon of hope” by working to get him elected. In the weeks before Tuesday’s runoff, I spent a few days getting an up-close look at Planned Parenthood’s efforts in Georgia, which drew staff from the national office and involved a local workforce—both paid and volunteer—of more than 100. The organization’s efforts were tactical but had a hint of the personal—after all, it was Handel who had once very publicly described the reproductive health group as “a bunch of schoolyard thugs.” The diligence of Planned Parenthood’s get-out-the-vote effort—ultimately unsuccessful—showcases the massive task ahead of Democrats if they hope one day to flip a traditionally Republican stronghold like the 6th. 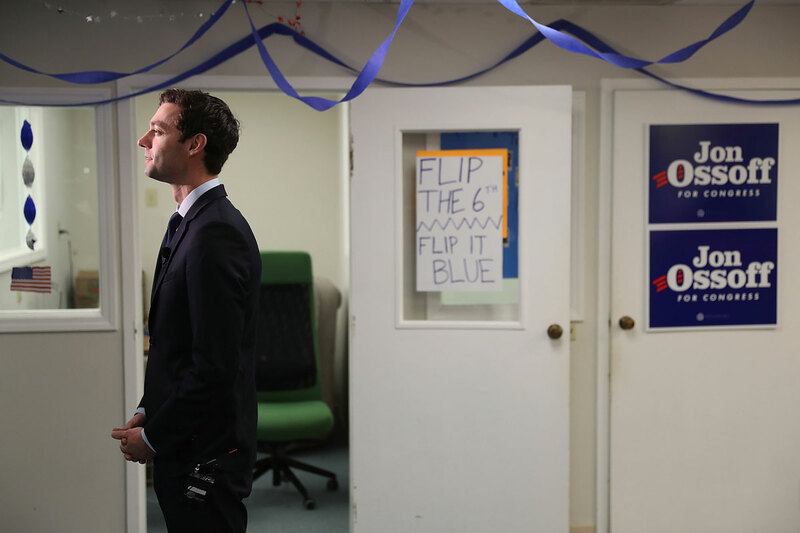 On a sweltering Wednesday, 13 days before the runoff, in an unmarked storefront in a run-down Marietta strip shopping center, about 40 mostly twentysomethings in matching T-shirts gathered for a communal pep talk as they prepared to go door-to-door on behalf of Democrat Jon Ossoff. Folding tables in the otherwise bare room were stacked with political fliers and iPads loaded with maps showing the names and addresses of voters to be targeted in that day’s outing. Poster-sized sheets tacked to the wall listed each canvasser and how many houses he or she had visited the day before, how many of those doors were answered, and, finally, how many of those interactions yielded a positive response. Ever since the April 18 special election, canvassers had been hitting the streets every day, in rain and brutal sun. Very few, if any, of them, however, had actually met their candidate—not so odd when you consider that their activities had no official connection to the Ossoff campaign. 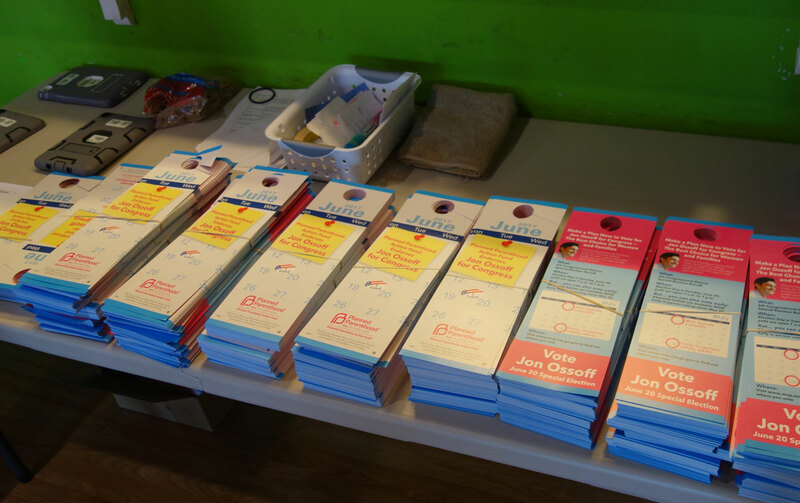 Instead, the canvassing operation had been funded by an independent organization, the Planned Parenthood Action Fund. 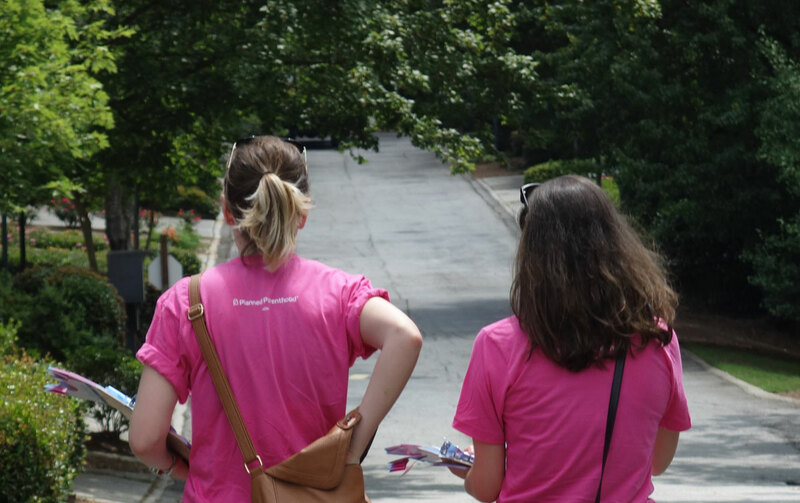 While the group also recruited about 50 volunteers to help out, mostly during evenings and weekends, the team assembled in Marietta consisted of paid canvassers hired and trained by Planned Parenthood operatives. Much of the media attention during the bruising 6th District race focused on candidate soundbites and the blizzard of pricey political ads by the dueling campaigns and deep-pocketed political action committees. But the bulk of virtually any race is fought at ground level, mailbox by mailbox, doorstep by doorstep. And in the fight to flip the 6th, Planned Parenthood was a major force, knocking on 20,000 doors before the special election and another 80,000 leading up to the runoff—more than double the effort of any other independent group supporting Ossoff. The organization knew from the start that an Ossoff victory was a long shot in a northern suburban district that Republicans—including former House Speaker Newt Gingrich and current U.S. Senator Johnny Isakson—had held for a generation, Deidre Schifeling, PPAF’s executive director, told me before Tuesday’s vote. In political parlance, the 6th is described as “R+10,” meaning a generic GOP candidate would normally enjoy a 10-point advantage over a generic Democrat. Last November, Tom Price—subsequently appointed to secretary of Health and Human Services—won re-election by 23 points. Planned Parenthood may be officially non-partisan, but to many on the right, including the pro-life Handel, it’s seen as a left-wing group that has become overtly political. After the former Georgia secretary of state lost the 2010 GOP gubernatorial primary to Nathan Deal, she took a high-ranking job at Susan G. Komen for the Cure, where, by her own account, she recommended ending the breast cancer charity’s annual grants to Planned Parenthood. When the cutoff became public, a backlash from Planned Parenthood supporters contributed to Komen losing millions in donations, leading Handel and several other Komen executives to resign. Out of a job, Handel doubled down in bolstering her pro-life political bona fides, writing a book titled Planned Bullyhood that accused the group of “browbeating” Komen into reversing its decision, and targeting her as the scapegoat. In the race’s two televised debates, however, Handel attempted to downplay her role in Komen’s decision to defund Planned Parenthood, even as her opponent hit the issue hard. On the campaign trail Ossoff said he would be “an unyielding defender of Planned Parenthood” and attacked Handel on her Komen record, making women’s reproductive rights one of the central issues of his campaign. Schifeling said that’s likely because, as Planned Parenthood’s sophisticated modeling system indicates, the group enjoys strong support in the 6th, Georgia’s wealthiest and best-educated district—still another reason it decided to enter the fray. While Planned Parenthood the parent organization could spend just $5,000 on behalf of Ossoff, thanks to the Supreme Court’s Citizens United ruling, the PPAF could provide unlimited support as long as it didn’t coordinate with the candidate’s campaign. In this case, that was hardly necessary—it was widely acknowledged that in order to flip the district, Ossoff’s side needed to win over independents, turn some Republicans, and get every breathing Democrat to the polls. PPAF’s strategy was to use shoe leather and big data to focus exclusively on sporadic voters who lean left. Leaving the Wednesday afternoon huddle wearing pink Planned Parenthood T-shirts, Makeda Martin and Toni Jordan, both women in their mid-20s, headed over to a Brookhaven townhome complex to begin canvassing. “We can look on our iPads to see which houses to visit and whether the resident has voted early,” Martin explained brightly. Still, the iPad sometimes got it wrong. “I’m a Republican,” one elderly woman told the canvassers when they said they were stumping for Ossoff. Two other homeowners said they’d already voted. “You’re knocking on the wrong door,” announced a man through the screen before the canvassers had said a word. Half the knocks went unanswered and a flyer was hung on the doorknob—sometimes joining one left by the Ossoff campaign. The women drove to a nearby cul-de-sac with newer houses and began again. Even when a receptive audience answered, conversations were kept short in order not to exacerbate voters’ election fatigue: Hello, I’m with Planned Parenthood and we’re encouraging people to vote for Jon Ossoff on June 20. Can I ask if you’ve voted? As the women neared the end of the street, a man with an Ossoff sign in his yard looked up from his weeding to cheer them on. “The GOP political machine is horrible,” he yelled after them. Pat yourself on the back if you remember the Democrat who ran against Price for the 6th District seat last November. The canon-fodder’s name was Rodney Stooksbury, who was quickly dubbed a “ghost candidate” because he ran no campaign ads, made no appearances, and could not even be found by reporters trying to prove he existed. And yet Stooksbury—as close to the theoretical generic Democratic candidate as you’re likely to find—received 124,917 votes in his showdown with Price, a six-term incumbent. That’s 24 more votes than Ossoff—who in just two months earned national name recognition more akin to Beyoncé than the suburban young politician he is—collected on Tuesday. The difference, of course, is that this week’s event was the runoff from a special election—and the only item on the ballot. Turnout is always at its peak during presidential elections; the 6th saw 326,005 total votes cast in November, a turnout of about 62 percent among about the district’s 521,000 registered voters—slightly higher than the national average of 58 percent. The special election in April to replace Price saw 192,569 voters come to the polls, but while runoff elections typically see a dismal falloff in turnout, Tuesday’s vote count actually rose about 39 percent, to 259,488. And while his percentage of the total vote remained steady from April to now, Ossoff garnered 32,220 more votes in those three months, a 34 percent increase. The results will certainly be pored over and reanalyzed in coming months, but the striking similarity between Ossoff’s tally with that of Stooksbury suggests that Ossoff and his allies might have scooped up nearly every Democrat vote there was to get—and it still wasn’t enough to overcome the GOP’s numerical advantage. When the voting records become available, the PPAF will cross-reference the voter turnout in neighborhoods it canvassed with those it didn’t to get a sense of how effective its efforts were in boosting turnout. Typically, Schifeling said, a successful canvassing operation can drive up turnout by 2 to 4 percent, adding that Planned Parenthood’s name recognition allows it to do as well as 6 percent. The organization is already planning for similar efforts nationwide in next year’s midterm elections, she said, although it will customize its strategy to each district. Georgia’s elections system desperately needs an update—but how?